Much as I love Portugal, I’ve never really got to grips with the language. I can have a vague stab at reading bits of Portuguese, using the remnants of my school Latin and Camino de Santiago Spanish, but my listening skills, which are always a little dodgy if the person doesn’t respond with one of the answers in the phrase book, are totally absent in Portuguese. It’s like the spoken language bears no resemblance at all to the written one. I do however have enough skills, combined with helpful graphic art to know that this wine translates roughly as lunatic, or person gone a little loony by the light of the silvery moon. 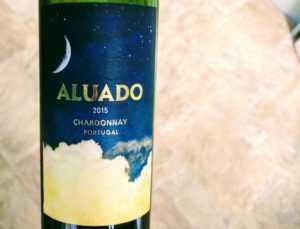 An interesting choice of name but as the moon has just unleashed partying and feasting in my neighbourhood as it’s signaled the end of Ramadan, I figured I’d join in with this bottle of Aluado Chardonnay ’15 from Laithwaites. It’s a pale golden yellow colour without much in the way of legs. It smells of peaches and apricot trees on a rainy day. It’s dry with a medium acidity and no tannin. The flavour was rather more intense than I’d anticipted from the smell. The peachy, apricot flavours carry on through along with a bright and refreshing lemon zing. The alcohol level is medium, as is the body. The flavour lasts quite well moving through lemon zest to cool peach. It is worth cooling, I found that the colder it was the more intense the fruit tasted. I used a little ice sleeve, but if I was serving a crowd a bucket full of ice water would work just as well, if not quite so elegantly. This wine comes from the Lisbon area, so it’s quite far south for such a fresh tasting wine, that must be down to he cool Atlantic breezes that make sitting outside on a pavement cafe in places like Lisbon and Porto so delightful even in the height of summer. 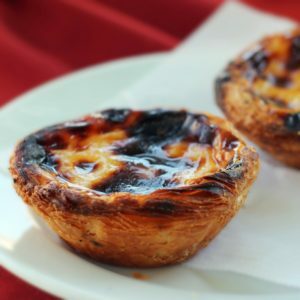 I do like sitting in pavement cafes in Portugal drinking wine and eating Pastel de Nata. I’ve tried making them at home, it doesn’t work. I’ve tried buying commercially baked ones in the supermarket, it’s not the same. Maybe it’s time for another trip to Portugal.